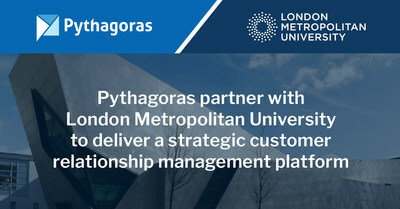 Pythagoras, a leading Microsoft Gold Partner and Inner Circle member, is delighted to announce a partnership with London Metropolitan University to deliver a customer relationship management platform as part of a suite of transformation initiatives across the university. Built using Pythagoras' Evolve HE, which accelerates the deployment and benefit realisation time of Microsoft Dynamics 365, the solution will replace the universities legacy admissions, marketing and alumni platforms, enabling London Metropolitan University to deliver improved, proactive communications with prospective, current and former students. Colin Charlton, Business Development Manager for Higher Education at Pythagoras commented; "London Metropolitan University is the latest university to develop a portfolio of transformation initiatives. We're pleased to be the partner enabling their digital-first programme, which will enhance the student experience, optimise resources and transform services across the university." Artur Vogt, Marketing Manager, Student Conversion & Insight at London Metropolitan University commented; "As the most diverse university in England with an extremely complex target audience, we required a state-of-the-art CRM solution to manage the relationships with our prospective, current and former students. The cutting-edge technology provided by Pythagoras is sophisticated, highly customisable and scalable. The system was tailored to fulfil all our requirements, allowing us to improve our customer service and drive student engagement across all channels. "The introduction of Microsoft Dynamics 365 with Evolve HE is anticipated to improve staff utilisation, saving the team 780 hours a year through extending automation and allowing the reduction of manual input tasks." Removal of silo data and creation of a single student view, enabling a more proactive approach to student engagement through better understanding of customer needs. Significantly enhanced student experience as a result of new multi-channel marketing automation, advanced audience segmentation and enquiry routing capabilities. Extended ability to analyse, report and act upon data interrogated by advanced business intelligence tools allowing the creation of accurate ROI insights and forecasts. Capacity to create seamless integrations with numerous third party apps and plugins in order to extend the system capabilities. Versatility, allowing a number of departments to embrace the new technology and employ it as part of their systems and daily processes. Delivery of increased brand awareness and value thanks to an integrated approach across the University. Improved privacy and GDPR compliance. London Metropolitan University has been providing education to people from all backgrounds since 1848. The University offers courses in a wide range of subjects, including art, architecture, design, computing, digital media, business, law, human sciences, social professions and social sciences. London Met's focus is on preparing its students for the working world, providing career-focused courses and a wide range of initiatives that can help enhance their employability. In 2018, London Met recorded its highest ever graduate employment score, with 96.7% of all graduates in work or further study six months after graduation. The Accelerator - London Met's specialist business incubator - also helps graduates get their enterprises up and running. Since its conception, it has helped more than 1,000 businesses grow. London Met is ranked the most socially inclusive university in England and has students from 142 nationalities. Pythagoras has worked with over 30% of UK universities to redefine their approach to student recruitment, engagement and retention using the Microsoft Cloud. Our dedicated Higher Education team understands the challenges of recruiting and retaining the highest calibre of students and the pressure that universities are under to ensure student satisfaction and wellbeing. Our solutions are specifically designed to give you a holistic view of each student from their first enquiry, throughout their time on course and after graduation, by pulling in disparate data sources, connecting departments and tracking communications and data trends.